This pin features "GET LOST - COMPLETE FIRST SEASON AVAILABLE ON DVD SEPTEMBER 6 with ABC logo and between the iconic LOST Season 1 main cast photo. 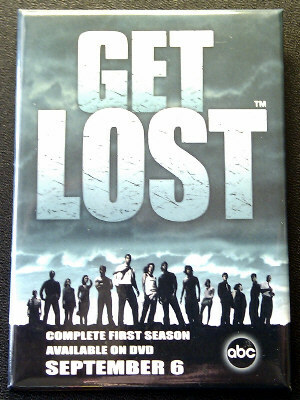 It was given out at the San Diego Comic Con 2005 to promote the LOST Season 1 DVD release. Size is 2 1/2 by 3 1/2 inch.